Oh boy what a stinker. 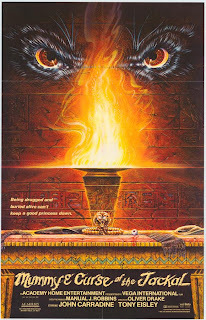 This is a painful sort of riff on the Universal mummy series with a were-jackal thrown in. The plot has an archaeologist adding the well preserved body of an Egyptian princess to his collection. When she is revived she goes out on the town with the archaeologist and friends. But then her not quite undead lover comes looking for her…oh and did I mention that the guy is cursed so that he turns into a werewolf… er… jackal? Yea, this is late 60’s low budget badness. I mean really bad with plot turns that are just one WTF after another- I mean the Goddess Isis shows up (and who knew she was related to Mr. Spock?). The make-up is awful, with the jackal mask being a werewolf mask from one of the directors earlier films. 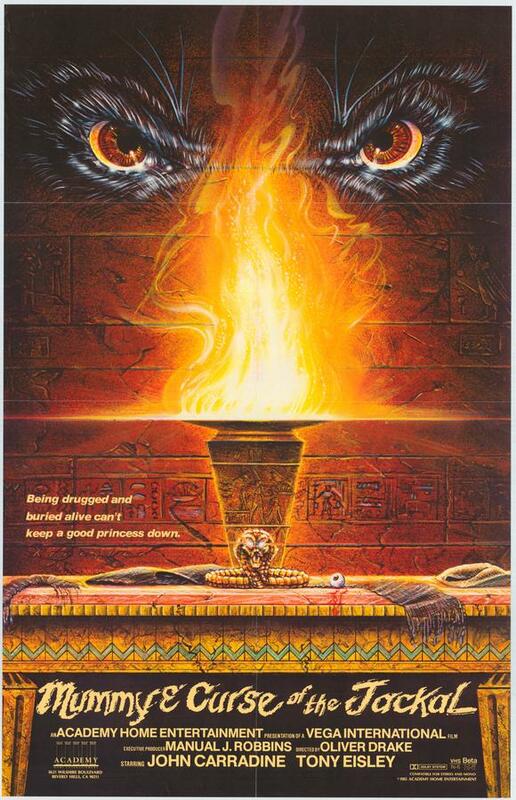 The mummy is, oh boy, beyond bad. I mean he , it looks like it was shellacked and it has this one eye popping out of the bandages and is the size of a softball. It’s laughable for a while and then it becomes just kind of sad. Actually what is sad about this movie is that this film rapidly goes from a good bad movie to one that is kind dull and makes you wonder why you’re watching it. This is one of those worst of all movies, a time waster. It feels sooo much longer than its 80 minutes, I mean I kept wondering when was this turkey going to end…some day maybe.